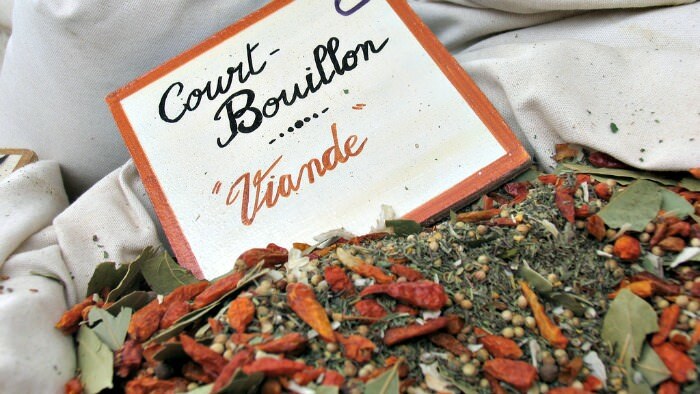 Are you curious to know a little bit more about court bouillon? Or just need a quick and easy, yet amazing recipe? You'll find everything that you need here. This flavorful stock is excellent for fish, and perhaps for other types of meats and vegetables as well. Court bouillon is a well flavored poaching liquid used for poaching meats or vegetables, but, primarily for poaching fish. It is usually cooked with a mixture of water, wine, and/or vinegar, also containing seasonings, herbs, and/or aromatic vegetables. In this case, the term court means short, and bouillon means broth. This is basically stating that it takes very little time to cook, being that no protein such as fish, poultry, or meat is added to it during cooking it. Initially, you'll want to bring the liquid just to a boil. Then immediately reduce the heat to simmer. Keeping the liquid at a simmer without allowing it to boil is the key. Boiling is violent. You want the flavors of the ingredients to infuse themselves with one another into the liquid. Boiling will cause more of the flavors to defuse out into the steam. 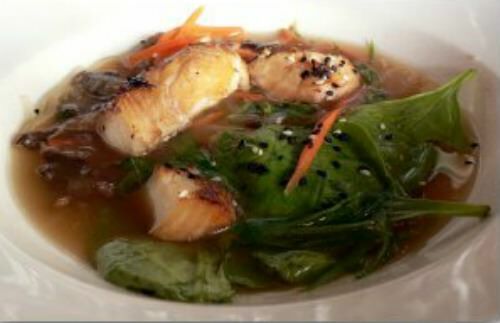 Fish in a court bouillon containing spicy red miso broth with pea shoots, carrots, asparagus and rice noodles. If you want, you can easily use these recipes in the microwave, rather than on the stove. Either way will be just fine, you'll ultimately achieve the same results. Once you have used the court bouillon you can save it to reuse it later. Why waste it. It becomes richer in flavor with each use. Strain into a container, pressing on the solids to extract as much flavor as possible, and cover it. Refrigerate it up to three days, or freeze it for several months until you're ready to use it again. These recipes can be used the way they are, or simply add or omit any ingredients that you wish to. These should give you the basic idea of what can be used for preparing your dishes. Note that if the fish is not completely covered in the liquid, then you should add more water. Also, you can double the ingredients for larger sizes or larger quantities of fish. Dry ingredients of herbs and spices for cooking a fish broth. Combine all of the ingredients in a pot or poacher. Cover and bring to a slow boil, simmer for 10 minutes. Allow it to cool. Add the fish, completely submerging it. Bring the liquid back to a boil, then lower heat to simmer for approximately 10-15 minutes or until the fish is done. Allow it to cool for a couple of minutes. Combine all of the ingredients in a pot or large pan. Cover and bring it to a boil. Lower heat and simmer for about 5 minutes. In an ovenproof pan, submerge the fish in the liquid. Cover and bake in a preheated 350°F oven until the fish is done. Follow any of the two above instructions for preferred cooking. As stated above, adding or omitting ingredients is suitable. Some ideas for that could include: freshly chopped sprigs of herbs such as tarragon, green onions, parsley, lemon juice, anise, fennel seed, other variations of whole peppercorns (i.e., green, white, pink, yellow, mixed), or sea salt.